Lang’s Nek was named after William Timothy Lang, who bought a farm located to the north and east of Mount Majuba in Northern Natal in 1874. 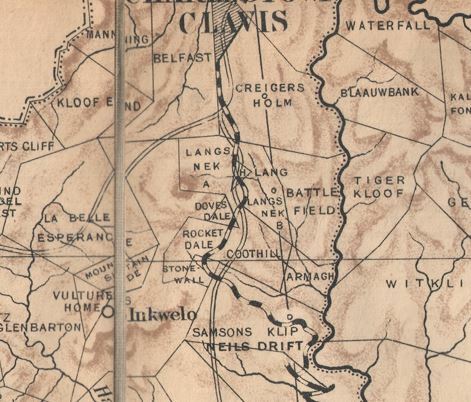 This is extremely well documented and cannot be disputed, but for the last 130 years, the pass itself, the road, the railway and the battlefield have all been erroneously spelled as “Laing’s Nek”. How this occurred is a mystery – perhaps a battlefield reporter or a cartographer made a careless mistake, and this has somehow been brought forward in perpetuity. Early maps of the region all have the correct spelling. The road is in an excellent condition and can be driven in any vehicle. Getting there: To approach from the south, travel in a northerly direction from Newcastle along the N11 for approximately 34 km to S27.503796 E29.858961, which is the southern start point. To approach from the north, start off in Volksrust at the intersection of Dr Nelson Mandela Drive (the N11) and Adelaide Tambo Street at GPS coordinates S27.367641 E29.885812. Travel in a southerly direction along the N11 for 8.9 km to S27.443122 E29.864036, which is the northern start point. We filmed the pass from north to south, in the descending mode. The pass begins on a fairly flat section of road, just after it has passed under a railroad bridge. There is a gravel road leading off to the right – this is a shortcut to the Free State town of Memel, via the Majubanek and Kwaggasnek passes. The huge mountain on the right-hand side is the famous Majuba; it dominates the skyline on the western side throughout the length of the pass. The gradient remains quite gradual on the short run up to the summit, as the road winds its way through a shallow S-bend. Do not be misled by the lack of traffic shown in the video – on the day of filming, there was a stop/go control located at the start, and this allowed us to film the pass without being obstructed by the numerous commercial vehicles which usually ply this route. This part of the N11 is normally subject to very heavy traffic flows, so pay attention and obey the speed limits. The summit is reached at the 2.4 km mark, just before the road bends through a sharp 90-degree corner to the right. There are two lanes at this point to accommodate a mandatory stop for trucks, but this changes back to a single lane during the short 100 metre straight leading up to the next bend. At the end of this straight, a small sign on the left indicates a turnoff to the Lang’s Nek Battlefield memorial site; if you intend to stop here, indicate your intentions early, and make sure that there is no fast-moving traffic behind you. A short sharp S-bend is followed by a straight of 300 metres, then by a 90-degree turn to the right. This leads into a long left-hand curve which culminates in a dip as the road crosses over a small stream. The road changes back to a double lane and descends gradually through a long straight of 1 km, crossing over the railway line about halfway down. A 90-degree right-hand turn with a wide radius is followed by a very shallow S-bend, the road first turning right and then left. The gradient now flattens out completely, and straightens up for a long stretch of 1.3 km. This section of the pass is notorious as the place where mobile speed traps are often deployed, so make sure that you within the posted speed limit of 80 kph. There are also static cameras at various other points along the pass, and if fact all along the N11; given the zero tolerance policy adopted in KwaZulu-Natal, you would be wise to slow down and enjoy the scenery. At the 7.2 km mark, the straight ends and the descent begins again in earnest. A sharp 100-degree right-hand bend leads into a short straight, the road surface covered by rumble strips. This is followed by a sharp left-hand turn, then by another bend to the right, the rumble strips again evident. The intention of these rumble strips is to warn you to slow down, but they in fact create a hazard, as they tend to cause your vehicle to skitter across the road, especially if you have a stiff suspension. A shallow S-bend then leads into a short straight of 550 metres. About halfway along this straight, the road dips as it crosses yet another small stream. At this point, you will notice a small signboard labelled “O’Neill’s Cottage” – this is not an accommodation establishment, it is a memorial site where the peace treaty which led to the end of the 1st Anglo-Boer War was signed. At the end of this straight, a long left-hand bend sweeps down to eventually culminate in a bridge crossing which signals the low point and the end of the pass, at the 8.9 km mark. 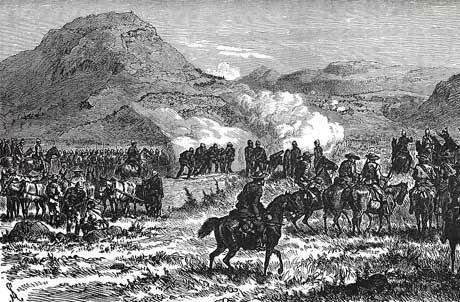 The Battle of Lang’s Nek, which occurred on the 28th of January 1881, was the first of three crushing defeats inflicted on the British army near the end of the 1st Anglo-Boer War. This engagement was followed by the Battle of Schuinshoogte (also called the Battle of Ingogo) and the decisive Battle of Majuba on the 27th of February of that same year, breaking the British spirit and resulting in a peace treaty. This led eventually to the Pretoria Convention, which ended hostilities between the two nations. The central figure in all three of these battles was Major-General Sir George Pomeroy Colley, who was Governor and Commander-In-Chief of Natal and the High Commissioner for South Eastern Africa. 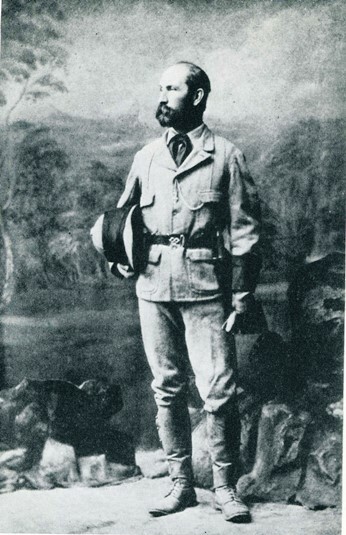 Born in November 1835, he was educated at the Royal Military College in Sandhurst, after which he served with distinction in the Cape Colony, China and Afghanistan. Although history has saddled Colley with the responsibility of the British defeats in Northern Natal, the truth is that he was burdened with a small and demoralised force of soldiers, and bewildered by a war that was being fought far outside of the conventional methods that he was accustomed to. He had progressively degenerated into a shadow of the confident, efficient commander that he had been at the outset of the war, to the extent that he would ultimately prove incapable of responding appropriately to the final catastrophe that would engulf him. One could argue that Colley's obsession with keeping up appearances and being seen to be doing the honourable thing at all costs was at the heart of his errors of judgment. This obsession may also have been a factor in his decision to attack Lang's Nek with an obviously inadequate force rather than await reinforcements and risk being accused of timidity in the face of the enemy. The crowning disaster of Majuba could have been avoided in its entirety had Colley not been so desperate to make one last attempt to redeem himself as a military leader. Colley's handling of the Lang's Nek affair had not been demonstratively inefficient, and the coolness and personal courage he displayed at Schuinshoogte could not be called into question. The assessment of his performance at Majuba could, however, be criticised more harshly. From the firing of the first shot, he failed to take control of affairs and allowed the increasingly confident Boers to dictate the course of events. At this moment of crisis, both he and the demoralised men serving under his command were found to be sadly wanting. 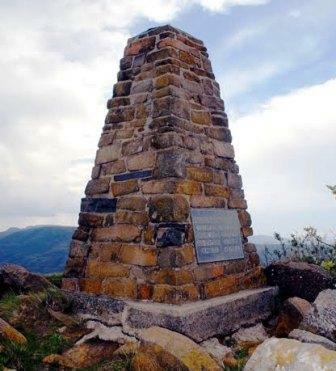 On the 26th of February 1881, after a night march and an arduous climb of eight hours, Colley occupied with part of his troops a height known as Majuba, with a commanding view overlooking the Boer camp. The next morning, after a comparatively harmless fusillade, the hill was suddenly and quite unexpectedly carried by a rush of the Boer forces, and Colley was shot dead by a rifle bullet through the forehead. It is difficult to defend Colley’s poor performance at Majuba. Once on the summit, he effectively abdicated all responsibility, choosing instead to play a waiting game and allowing the Boers to hold the initiative throughout the action. Following his competent handling of the troops during the two preceding engagements, this ineptitude is surprising. It lends credence to the theory that Colley was by then in a state of mental and emotional crisis. For the Boers, the 1st Anglo-Boer War was a memorable triumph over what was then the world’s most powerful empire. The failure of George Pomeroy Colley shows the other side of the coin. It encapsulates the poignant tragedy of a brave and fundamentally decent man thrown into a situation beyond his capabilities, paying for it with his reputation and, ultimately, his life.